As we approach the end of 2016, the most important deal concluded for post-sanctions Iran this year was not among the headline-grabbing agreements signed by Boeing, Airbus, Renault, Siemens, Shell, or Total. Rather, it was a much smaller deal that received absolutely no coverage in the international business media. In May of this year, German FMCG manufacturer Henkel purchased the remaining shares in its local joint-venture, Henkel Pakvash, taking its ownership to 97.7%. The company was able to deploy EUR 62 million to make the acquisition by purchasing shares on Iran’s Fara Bourse. In August, Henkel subsequently purchased the detergent business of Behdad Chemical for approximately EUR 158 million. Henkel’s two transactions should be considered the most important of 2016, not only because they were successfully completed (in contrast to many of the larger deals that remain at contract stage), but also because these transactions are reflective of the most important kind of capital deployment for Iran’s near-term economic growth. Both supporters and opponents of the Iran Deal have been focused on the billion-dollar contracts being made between major multinationals and Iranian state-owned enterprises. The logic is simple. Iran is a large economy and the true economic value of the Iran deal will only be reached when the country receives billions of dollars of foreign direct investment. Iranian officials have boasted of a USD 50 billion target for FDI in 2016, a massive leap from the USD 2 billion registered the previous year. Reports suggest that Iran will more likely achieve around USD 8 billion. 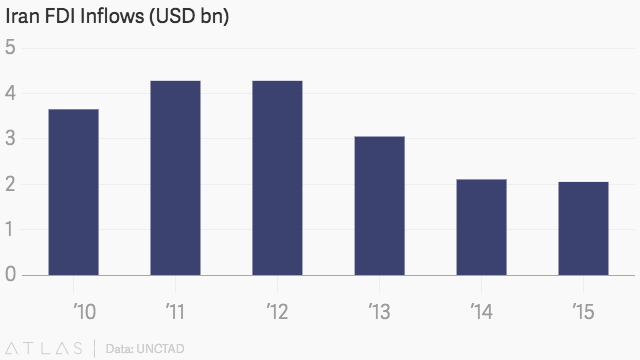 It took the Russian economy eight years (from 1999 to 2007) to see FDI inflows rise from levels commensurate with the current levels in Iran to the USD 50 billion milestone. While the process may take less time in Iran, business leaders and policymakers need to focus on what can be achieved in the next year. By necessity, larger deals operate on longer timeframes. It will take years for Airbus and Boeing to complete their deliveries, or for Shell and Total to start pumping oil, and for Renault and Daimler to ramp up production. In effect, the contracts signed today will only manifest their full economic value in the next five to ten years. In the private sector, timeframes for investment are much shorter. As the Henkel deals show, investment in private sector firms can happen quite quickly, even just months after Implementation Day. These transactions are the potential spark for Iran’s economic engine and they represent the overlooked landscape of Iran’s economy. The bulk of untapped economic value lies in the private sector. Privately-owned companies maintain dominant positions in consumer-facing sectors such as FMCG, food and beverage, pharmaceuticals, consumer technologies, and hospitality and tourism. These companies, some of which are family-owned and some of which are publicly-held, are led by a globalized class of managers, many of whom have studied and lived abroad. Therefore, these companies operate much closer to international best practices for key functions such as accounting, supply chain management, human resource management, and marketing and communications. While many of these firms are under financial duress due to the lasting effects of sanctions, they nonetheless possess strong market share and significant cash flow, making them ripe for turnarounds. Some are in superb financial shape. Most importantly, these companies are identifiable, if not widely known. While the firms and their owners have remained out of the limelight of Bloomberg, Reuters, or the Wall Street Journal, the grapevine in Tehran has a way of determining which companies deserve to be counted among the top 100, and which are the true standouts. The much talked about “positive list” of clean and compliant companies already exists—one just has to be on the ground in Tehran long enough to catalogue it. This is a small group of companies, at most numbering around one hundred . The very largest of these companies generate around USD 1 billion in revenue. As such, most of these enterprises would require relatively little capital for a strategic or financial investor to take a meaningful, if not a majority, ownership position. This is particularly true if one considers that leveraged buyouts—with debt financing coming from Iran—could be part of the capital solution. Realistically, the value of the purchased stakes, whether majority or minority, would rarely exceed USD 200 million and would probably average between USD 20 to 50 million. Such transactions are small enough that they would enable the investing company or fund to mitigate the banking sector challenges that are currently throttling Iran trade and investment. The smaller banks that have begun to work with Iran are equipped to handle transactions of this size without breaking their balance sheets. By the same token, it is far easier to convince a large bank to facilitate a smaller transaction on the back of significant investor-led due diligence. Strong evidence for this can be seen in the success of Pomegranate, a Swedish investment fund, in deploying approximately EUR 60 million into Iran's tech sector. Looking for one hundred companies with a high average acquisition transaction value of USD 100 million dollars means that a total of just USD 10 billion is needed to trigger a fundamental change in Iran's economy across numerous levels, from company operation to macroeconomic conditions. Foreign investment is a protracted process. It will make an impact on the acquisition target at numerous stages, as new strategic shareholders take positions across Iran’s private sector. In the vetting stage, private sector firms will need to prepare themselves for due diligence, taking further steps towards better accounting and corporate governance practices. These firms will also have to embrace internationalization, becoming more knowledgeable of the global commercial landscape, and improving their capacity to engage with foreign investors or partners. When executed, the investment itself will fund knowledge and technology transfers, with the new foreign owner proving their “value-add” by helping the Iranian company make improvements in management and operations. While the paper and its data are over a decade old, the fundamental findings may be even more valid today. Given the date of publication, the authors did not account for the additional impact of post-sanctions investment. They could not have predicted the great strides the private sector has made over the last decade. Certainly, there is ample research that establishes the “positive correlation between growth of national incomes and private investment ratios.” Research also shows that foreign direct investment drives greater private domestic investment in what is called a “crowding in” effect. Finally, in today's world, trade flows are fickle. An anti-globalist turn in politics makes trade a weaker link for constructive international relations. For Iran to achieve true integration into the global economy, shareholder equity will be the tie that binds. By bringing more foreign shareholders into it's economy, Iran will rise in importance in the economic agendas of its European partners. A direct investment of USD 10 billion is smaller than the total value of the Boeing/Iran Air deal. Growth capital, triggering value-creation, is what is needed at this crucial moment. Deploying a mere USD 10 billion of such resources into Iran's private sector in the next few years will create more economic value than pouring even larger amounts of capital into mature, state-owned enterprises. Investors and policymakers should take note.